This Brew's for You, Tea Party! This Brew’s for You, Tea Party! Want a pick-me-up? Try Electric Chair Jolt, the tea that brings the vibe. Think Mitt shot himself in the foot by waffling on abortion? Try Mitty Mitty Bang Bang tea. 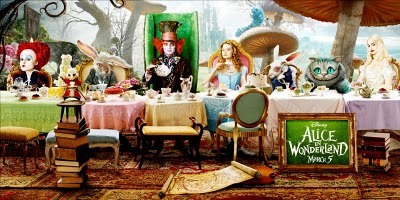 A tea party with lots of strange characters -- sound familiar? Worried that fence on the Mexican border isn’t high enough? Go for some No Hombres Aqui tea. Longing to bring prayer back to public schools? Amen-a-tea is the brew for you. Hate Nancy Pelosi and other feminist politicos? Have some Libber-free tea. Think impoverished folks don’t pay enough taxes? Savor a soothing sip of Soak The Poor tea. In a New Jersey state of mind? Clamor for Chris-tea. Invited to a gay wedding? Toss that invite away, you homophobe, and grab a cup of No LGB-Tea. Fanatical in your opposition to abortion rights? Don’t just drink a cup of It’s Not Your Body tea — have someone else pour it down your throat. Don’t know what to think? Whatever you do, don’t think for yourself! Instead, turn to Limbaugh’s Pundit tea. Is Newt “fly-me-to-the-moon” Gingrich starting to sound a little too wacky, even for you? Calm yourself down with soothing San-A-tea. Can’t wait to see a gigantic neon cross on top of the Capitol Building? Savor a cup of Theocra-tea. You’re tempted to cheat but don’t want to break your marriage vows? Man up with Nervy Newt tea. Old, angry and bitter? What you need is McCain’s Many Houses tea. Steep for five minutes — and don’t forget to drink! Need a break from candidate robo-calls? Sit back and enjoy a cup of Wasilla Wonderful. Place bag in cup, pour in hot water, grab your gun and go out and shoot a moose. When you return, it’ll be ready!